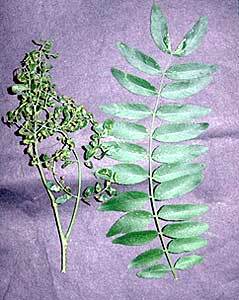 Adult and nymphal feeding causes a wide range of injury from yellow stippling of the foliage, leaf distortion, stunting and (sometimes) defoliation. Low to moderate levels of injury may render nursery and garden center plants unfit for sale during the year of attack. Eggs over-winter hidden under bark of 2-3 year old twigs and hatch at budbreak. Young nymphs migrate to the newly expanding foliage and begin to feed by puncturing cells with their piercing-sucking mouth parts. The most serious injury is incurred at this time. Later, once the leaflets are fully expanded, feeding by nymphs and adults results in many yellow spots, which is sometimes referred to as "stippling". 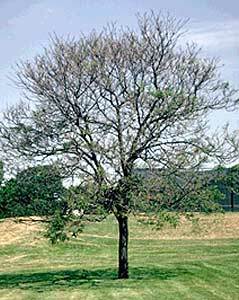 There is one generation per year and feeding is usually finished by mid-June in southern New England (approximately 58 - 300 GDD). Injury is worse in years where cool temperatures prevail for several days soon after budbreak and leaf expansion is greatly diminished. 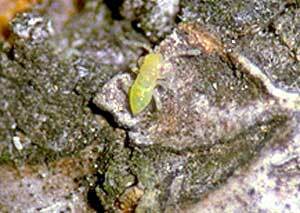 During these times, the plantbug can create enough injury to cause defoliation. At budbreak, branches can be shaken or jarred over a white piece of paper and new nymphs can be counted. 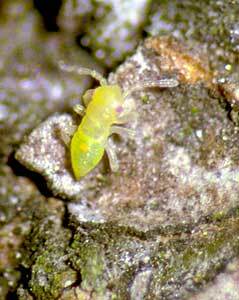 They are small and have a pale greenish-yellow coloration. Pesticides can be applied at this time if the numbers are high.